The OEM only sells structural parts to certified collision repair shops (and soon, its own in-house body shops). Tesla service staff are the only ones allowed to perform mechanical and service work. This division of labor still implies that non-network collision repairers can perform cosmetic repairs on Teslas. But Tesla’s online service information and repair procedures only appear to be available in Massachusetts to parties outside the certified network. For the rest of the country, shops seem to be out of luck. Seeking to stave off 50 competing laws following Massachusetts’ adoption of right to repair, the OEMs in the Alliance of Automobile Manufacturers and Association of Global Automakers in 2014 signed a historic memorandum of understanding with aftermarket trade groups. The document granted similar “right to repair” terms to all 50 states by 2018, according to Potter, whose organization is a go-between for independent repairers and the OEMs on mechanic and body shop requests for information. 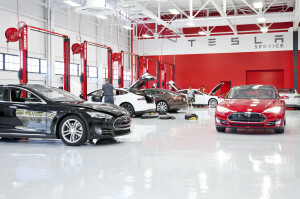 However, Tesla is not a member of either signatory OEM group, and Potter indicated Thursday that Tesla isn’t participating in right to repair and generally seems to be ignoring the issue. “They don’t talk to anybody in the industry,” he said. As usual, no Tesla press or auto body representative contacted on the issue responded to our inquiries. Both certified and uncertified shops can obtain Tesla’s labor times for repair procedures on AudaExplore (and soon CCC) under an exclusive partnership signed in 2015, but not the actual instructions for those procedures. An ALLDATA customer service representative said it doesn’t offer support for Tesla repair procedures either. The only avenue for repair procedures truly seems to be the Tesla’s service and repair site, which won’t allow any state other than Massachusetts to be used in one’s billing address, effectively stymieing out-of-state shops from buying access. Some assistance might be “in the works,” at least for Tesla owners who want to play DIYer, according to a January Tesla Motors Club discussion between a poster and “JonMc” (whom Electrek indicates is Tesla global head of sales and service Jon McNeill). It’s possible that McNeill was referring simply to the idea of selling owners parts, but the forum and Electrek seemed to take it as the release of service information. Electrek couldn’t get more information out of Tesla. Tesla also does not appear to sell scanning and calibration equipment outside of certified collision repair centers. Granted, with a car like a Tesla (or really any vehicle nowadays) there might be little damage that counts as purely cosmetic, lacking all impact on the car’s function. Tesla defines structural parts as anything permanently affixed to the vehicle, which is probably a fair amount of the car. Nevertheless, suggesting uncertified shops can perform cosmetic repairs and permitting them to do so through unrestricted parts while simultaneously failing to provide the procedures and equipment likely needed to conduct such repairs creates an untenable grey area for the collision repair industry. Either formally restrict cosmetic repairs and parts to certified body shops who have the proper equipment and repair procedures to do the job. Go the right-to-repair route and make all repair information and repair equipment available to the collision repair masses. As with other luxury OEMs, making information and service equipment available under R2R wouldn’t preclude Tesla from restricting parts. Otherwise, it’s just going to waste the time and money of owners, cosmetic repairers and insurers — and raise safety, performance, diminished value and liablity concerns for the various parties. Here’s why. A shop in good faith accepts a Tesla in for a truly cosmetic repair. But the staff realizes they can’t access Tesla repair procedures — the standard of care, all three major collision repair trade groups and I-CAR agree — for how to properly do the repair. The shop is either going to have to wing it — which besides being unprofessional could lead to the shop being obliterated in court for an error given the existence of said procedures — or surrender it to someone who has the information to do the repair properly. On top of potentially injuring the vehicle, the shop also might risk injuring an employee. Tesla requires all “Satellite Cosmetic Repair Locations” affiliated with structural body shops in its network to complete an hourlong electric vehicle safety class online. But let’s say our hypothetical shop lucks out and magically completes all physical repairs exactly to the OEM repair procedures and tolerances, without injury to the vehicle or an employee. There’s no way to scan and calibrate the vehicle. Faced with a Silicon Valley car that can partially and soon completely drive itself — and constantly reconfigure itself with on-air software updates — it seems insane from a professional and “sleep soundly at night” perspective not to check and calibrate a Tesla. Again, this leaves Tesla cosmetic repairers either risking liability and customer injury for an incomplete repair or sending the work to Tesla service staff or a certified collision repairer. Delivering a vehicle with an improvised or incomplete repair should be a nonstarter for any collision repairer or insurer who is a professional or at least doesn’t want to risk a bring-back, buyback, or lawsuit. Unfortunately, it’s likely that some uninformed or unethical shops will still roll the dice on this, particularly once a lucrative stream of hundreds of Model 3s start appear in their markets. So the only real option appears to be a surrender of the vehicle over to a certified repairer. The customer and insurer just had their time or money wasted by the detour to the uncertified shop, which runs contrary to Tesla’s auto body program goals. Correction: An earlier version of this article mischaracterized the role of the National Automotive Service Task Force. Executive Director Skip Potter described the organization as a “go-between” for independent repairers and the OEMs on mechanic and body shop requests for information; it is not tasked with the actual enforcement of “Right to Repair.” The article has since been updated to reflect this.